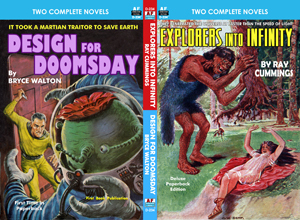 Armchair Fiction presents extra-large editions of classic science fiction double novels with original illustrations. The lead-off novel is a rollicking tale by Ray Cummings, “Explorers into Infinity.” Maybe there is no hope…or is there. Through an instrument called the myrdoscope, Brett Gryce sees a girl in a distant world, menaced by a giant. Her world is so vast that a second of Time there takes whole years of Earthly measure. During three years he catches glimpses of the girl and her peril, the giant about to bring down a huge tree on her head, and the girt awakening to a sense of terror, but all this has taken but a second of Time on that vaster world. Brett and Martt Gryce set out to rescue the girl. In a space-ship invented by their father, Dr. Gryce, which can change its position in Time and Space. They increase their size to fifty million times what it was on Earth, and penetrate beyond our universe faster than the speed of light, until they are lost in the black immensity of Space. The second novel “Design for Doomsday” is a great sci-fi adventure tale written by Bryce Walton. The Martian prison was be a cruel and cold place in the post-Solar War era. Zharkonism was the new ruling class of the universe, and two imprisoned human Guardsman hoped for an end to the rule, or to their futile lives. After an attack on their stronghold, the rule of Zharkonism was hanging by a thread, as their leader, Zharkon the First, had suffered a major blow, as the injured double-brain held the key to intergalactic peace following years of the Solar War chaos. In a last-ditch effort to fight the evil tyranny of the Zharkonian elite, Guardsman Venard and Larson, along with two Martian friends and allies, concoct a self-sacrificing plan that would could destroy the paralyzing walls of the Martian prison. Their actions would either incite the long-awaited revolution, or finally free themselves from the pain and torment as prisoners of war inside of a Martian stronghold.